Calcium Rich Rotis. Calcium Rich Parathas. Rotis and Parathas lend themselves to sheer innovation. From the base flour used in the dough, to the ingredients stuffed inside, there are just too many ways to tweak standard recipes, to produce exciting new creations, completely personalised to your tastes. To start with, give this collection of delightful rotis and parathas a dekko. From stuffed parathas and plain ones, to everyday rotis and exotic ones, this section provides several interesting recipes to perk up your meal! Experiment with the use of calcium-rich ingredients like ragi flour and jowar flour along with stuffing made of dals and paneer. This section will surely inspire you to pep up the calcium-quotient of your meal! Ragi or Nachni is rich in calcium and extremely healthy to use for a roti. Nachni and Onion Roti or Gluten Free Ragi Roti go well with Onion Raita. You can add Mooli to the roti to get Radish Nachni Roti. Another way to get your Calcium is to have a healthy stuffing like paneer or even have your base of paratha made of Ragi. Stuffed Nachni Paratha and Heberd Paneer Paratha are worth trying. 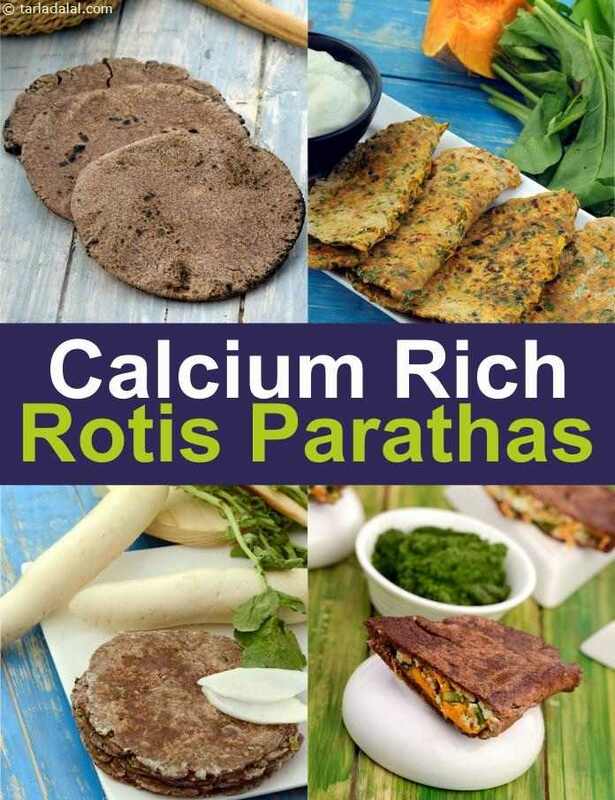 Enjoy our collection of Calcium Rich Rotis. Calcium Rich Parathas given below from Calcium Rich Breakfast to Desserts. The spiced paneer and onion stuffing in the to make these healthy calcium rich parathas....sure to be enjoyed by all adults…. Good for bone building…low fat paneer has been used here as regular paneer is loaded with fat which can hinder calcium absorption.